When Philadelphia-born Dave Frederick moved to Lewes in 1975 to accept a Cape teaching and coaching position, he quickly found his second hometown. Frederick coached three seasons a year for the next 13 years. 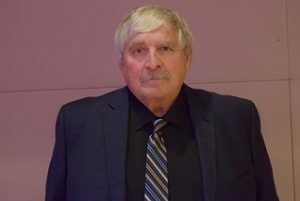 As head track coach 1976 – 86 and head cross country coach 1977 – 78, he led his teams to 1976 &1978 state titles in track ,1977 in cross country and 1984 and 1985 indoor track. His biweekly Athletes of the Week section has showcased thousands of smiling Cape district students. Frederick claims the Viking fields as his turf, the Viking gym as his house and Viking athletes as his kids. They all know him and they all still call him what his track team called the new coach from Philly in 1975: Fredman.